The World War I-era right-hander who played under the name Jim Bluejacket possessed key perquisites for pitching success: intimidating size, good stuff, and the ability to change speeds effectively. But he also had to contend with a ruinous shortcoming: the weakness for alcohol that pervaded his career. In the end, intemperance won out, precipitating Bluejacket’s departure from the major-league scene in what should have been his pitching prime. Notwithstanding that unfulfilled potential, it appears that Bluejacket led a happy and productive life in his later years, particularly while living on the Dutch Antilles island of Aruba. There, Jim worked for Standard Oil of New Jersey for 15 years and spent untold hours of his free time imparting baseball instruction to local youth. In appreciation, a street in the capital city Oranjestad was later named in his honor. Large (eventually 6-feet-2½ and well over 200 pounds) and athletic, Jim began playing baseball while still in school, but the mists of time handicap inerrant exposition of his early pro years. Contemporary news reports related that upon finishing his four years at tribal school, Bluejacket returned to the reservation and began farming, his father’s occupation.8 In the spring of 1905 Sporting Life reported that the Sedalia Goldbugs of the Class C Western Association had signed an outfielder named Bluejacket,9 and Baseball-Reference credits the .125 (5-for-40) batting average posted by this Bluejacket to our subject. But other players named Bluejacket were also active during this period, and Jim’s age (still only 17) and the fact that this Bluejacket was an outfielder, not a pitcher, cast doubt upon the attribution.10 In February 1906 the young man who would become Jim Bluejacket enlisted in the United States military. He lasted a mere six weeks, mustered out honorably on grounds of eyesight disability.11 Other sources, meanwhile, assert that our Bluejacket got his baseball start around 1907 with Bartlesville in the Class D Oklahoma-Arkansas-Kansas League.12 Another report has Bluejacket beginning his playing days as a member of a traveling Indian team called the Kickapoos, before settling down to play with a semipro team in Pittsfield, Illinois.13 In 1909, however, the Jim Bluejacket trail finally becomes traceable. He spent that season pitching for the Keokuk (Iowa) Indians of the Class D Central Association, going 14-12 in 257 innings for a third-place (80-57) club. The following year, Jim returned to Keokuk, but neither the club (67-70) nor Bluejacket (15-17) improved their performance over the previous campaign. After getting off to a 4-4 start for Keokuk in 1911, Bluejacket was optioned to the Pekin (Illinois) Celestials of the Class D Illinois-Missouri League. Here, his fortunes improved – both on and off the diamond. Professionally, Jim yielded barely one run per game in going 15-11 for his new club. Personally, he began courting Jennie Piro, the Pekin teenager who would become Mrs. Bluejacket the following year. Still in Pekin for 1912, Jim posted a 19-13 mark before being sold to the Bloomington (Illinois) Bloomers of the Class B Three-I League in August. Five late-season wins there boosted his combined record to an eye-catching 24-16 in 359? innings, prompting the Los Angeles Angels of the Class A Pacific Coast League to draft Bluejacket from the Bloomington roster. It appears, however, that Jim saw no action with the Angels before he was returned to Bloomington in early December.14 The year concluded with William L. Smith, aka Jim Bluejacket, and Jennie Piro tying the knot in Carthage, Missouri, on December 23, 1912. In time, the birth of sons Fred (1913) and James Louis (1918) would complete the family. Back in a Bloomington uniform for the 1913 season, Bluejacket turned in an excellent 23-13 record that attracted little notice; Sporting Life, an assiduous coverer of minor-league baseball, did not publish his name even once during the year. Nor did Bluejacket receive attention in the offseason. Even Federal League recruiters in search of the manpower needed to launch the circuit as a major league paid him no heed. That would change in the months to come, but for the time being, Bluejacket remained stuck in Bloomington. With age 27 coming into view, the big right-hander overpowered the Three-I League, combining a newly developed slow ball with his natural speed and good control to great effect. By the time a 12-game winning streak was halted,15 Bluejacket was under contract to the New York Giants and scheduled to report to manager John McGraw at the close of the Bloomington season on August 27.16 But shortly thereafter, it was discovered that Bluejacket had jumped his new Giants contract to sign with the Brooklyn Tip-Tops of the Federal League for better salary terms, plus a $1,000 signing bonus.17 In defense of the signing, Brooklyn owner Robert B. Ward, a principled man who had publicly forsworn the signing of any player under contract to another club, maintained that he possessed documentary proof that “Bluejacket had accepted our terms long before the Giants ever heard of him.”18 Given the priority of this commitment, Ward intended to keep him. Bluejacket would play for Brooklyn. While both clubs consulted their lawyers, Jim Bluejacket made his major-league debut against the Kansas City Packers on August 6, 1914. Unable to resist a matchup of “aborigines,” the clubs arranged for Bluejacket to face right-hander George “Chief” Johnson, a Winnebago Indian. Both men pitched well, with a two-run Brooklyn first inning providing the only scoring in the 2-0 outcome. Over seven innings – the game had been shortened by prearrangement so that the Packers could catch a train – Bluejacket scattered six hits, striking out three while walking only one. Jim pitched well again in his second outing, against the St. Louis Terriers, the only concern being a ninth-inning liner back through the box that he batted down with his pitching hand. Thereafter hampered by the resultant aching hand, Bluejacket’s pitching was not nearly as effective for the remainder of his maiden major-league season. But in the second game of a September 7 doubleheader against the Pittsburgh Stogies, Jim was able to put something else in his repertoire to good use: an exceptional pickoff move. Entering the game in the top of the ninth with enemy runners on base and Brooklyn down a run, Bluejacket immediately picked Steve Yerkes off first, retiring the side. He then adjourned to the bench as his teammates took their last at-bats. 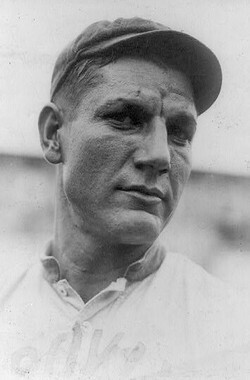 A two-run rally later and Jim Bluejacket was in the record books – the first major-league pitcher to receive credit for a victory without having thrown a pitch. In all, Bluejacket made a respectable big-leagues start, going 4-5, with a 3.76 ERA in 17 games. Although New York did not pursue threatened litigation, the Bluejacket controversy did not abate in the offseason. In November various newspapers published reports alleging that Bluejacket had come to regret not honoring his Giants contract and that he was attempting to reconcile with the club.19 These reports drew a swift and unequivocal denial from the hurler himself. In a letter to sportswriter Henry Lipman published in Sporting Life, Bluejacket expressed “disgust with the false stories printed in the newspapers,” denied any contact whatever with the Giants, and proclaimed his loyalty to Brooklyn. He believed himself lucky to be on a team owned by men as “honest” and “courteous” as the Ward brothers, with his only regret being that “my work for them was not better.”20 With that settled, the controversy died. The 1915 season saw the return of Bluejacket to the Tip-Tops, and the first publicized manifestation of the erratic behavior that would stunt his playing career. Expected to be a mainstay in manager Lee Magee’s rotation, Bluejacket was put on the sidelines by a leg sprain in an early-season start against Buffalo, an injury that Bluejacket blamed on Magee’s’ “insistence that the pitcher change the angle of his delivery.”21 Bluejacket was given time off to allow the leg to heal, but when club management checked in on him, Bluejacket’s hotel room had been vacant for days. Neither his wife in Illinois nor the Smith family back in Oklahoma had had contact with the hurler, and he remained AWOL in parts unknown for six weeks.22 He finally returned to the club on June 15 – and was promptly restored to the pitching-strapped rotation by Magee, just as if he had never been gone.23 The remainder of the season proceeded uneventfully, as the Tip-Tops finished out a noncontending 70-82 season. Bluejacket’s work was about on par. He went 10-11, with a 3.15 ERA, but had been wild, surrendering 75 walks (compared with only 48 strikeouts) in 162 innings pitched. Although he would pitch professionally into the early 1920s, the big-league career of 29-year-old Jim Bluejacket was now over. In parts of three seasons, he had posted a 14-17 record, with a 3.46 ERA in 236? innings pitched, striking out 78 while walking 97. Upon his release by the Reds, Bluejacket refused to return to Bloomington. His contract was therefore assigned, again on condition, to the Milwaukee Brewers of the Class A American Association. After Jim had gone 1-2 in a “brief but stormy trial, the Brewers had no use for the redskin and shipped him back to Bloomington.”31 Bloomington, in turn, promptly dispatched Bluejacket to the Dallas Giants of the Class B Texas League, where it was hoped that he would benefit from the supervision of manager Joe Gardner, a tough disciplinarian.32 Bluejacket pitched well in his no-decision Dallas debut, but was apparently set adrift at season’s end by the tail-end (55-85) Texas League club. In March 1917 it was reported that Bluejacket was seeking reinstatement with Bloomigton.33 The Bloomers took him back, if only to sell Bluejacket, again on condition, to the Lincoln Links of the Class A Western League. Bluejacket was shelled 7-0 by Denver in his Western League debut, and immediately returned to Bloomington. Thereafter, it appears that Bluejacket descended to the Central Association, the bottom-tier minor league where he had got his professional start, pitching briefly for the Clinton (Iowa) Pilots.34 But by mid-May, Jim was back in the Three-I League, on loan from Bloomington to the Alton (Illinois) Blues. He did not stay there long, abandoning Alton within days of his arrival to join the Nebraska Indians, an itinerant semipro nine. Reaction to his departure was adverse, with one local newspaper sneering that Bluejacket’s new situation would afford him the liberty to “indulge his inclination for absorbing brewery products.”35 A month later, Bluejacket returned home to Adair to register for the World War I draft under his birth name: William Lincoln Smith. Where, if anywhere, he pitched after that is unknown, as many professional leagues suspended play during the latter half of the 1917 season. Although the surviving evidence is largely circumstantial, it appears that as Bluejacket’s baseball days receded, the positive aspects of his persona came to the fore. Jim had always been intelligent and well-spoken, and now he became increasingly more responsible, as well. A skilled welder, he traveled extensively in the employ of Standard Oil of New Jersey. About 1929 he and his family relocated to Aruba, where he served as a Standard Oil foreman in the [then] largest oil refinery in the world. A large, amiable man with an outgoing personality, Jim did much to popularize baseball on the island. He spent innumerable hours of his off-work time teaching the game to local youth, and was instrumental in the construction of the Lago Sports Park in Oranjestad.40 Although it would take decades to flower, the seed for the Aruba baseball talent that began arriving in the major leagues late in the 1980s was planted by Jim Bluejacket. Upon retiring from Standard Oil in 1944, Bluejacket returned to Greybull, where he was received warmly by those who remembered him from his local playing days of 20 years before.41 Sadly, within two years, his health began to fail. Suffering from hypertensive heart disease, Jim spent his final days in Pekin, Illinois, his wife’s hometown. He died there on March 26, 1947, the immediate cause of death being a gastric hemorrhage suffered a week earlier.42 Jim Bluejacket was 59. Following a Funeral Mass at St. Joseph’s Church in Pekin, he was laid to rest in the parish cemetery. Survivors included his wife, Jennie; sons Fred and James; and his brothers Louis Smith and David Smith. Aside from a handsome headstone in St. Joseph’s Cemetery (where Jennie, who died in 1987, lies next to him), Jim Bluejacket Straat (street) in Oranjestad, Aruba, commemorates his memory. Jim Bluejacket also has a living memorial: former pitcher Bill Wilkinson. When the Seattle Mariners reliever made his major-league debut on June 13, 1985, he and Jim Bluejacket became the first great grandfather-great grandson duo in major-league history. 1 Although he appears in the 1900 US Census as William L. Smith, age 13 and living with his family in Adair, our subject lived his adult life as Jim Bluejacket – except when dealing with officialdom. His 1912 Missouri marriage-license application recorded his name as William L. Smith, and he himself filled out his World War I draft registration card as William Lincoln Smith. The oft-published notion that Bluejacket’s birth name was James Smith is erroneous. 2 Sources for the biographical data presented herein include the Jim Bluejacket file, with questionnaire, maintained at the Giamatti Research Center, National Baseball Hall of Fame and Museum, Cooperstown, New York; family history accessed via Ancestry.com; certain of the newspaper articles cited below, including the Bluejacket obituaries published in the Pekin (Illinois) Daily Times, March 26, 1947, and Greybull (Wyoming) Standard and Tribune, April 3, 1947; a brief portrait of Bluejacket posted online by an unidentified niece; and, particularly, a Jim Bluejacket biographical profile written by Carole Hill Martin, accessible online via http://illinoisancestors.org/tazewell/Biographies-b.htm. Unless otherwise noted, the statistics offered herein have been taken from Baseball-Reference. The siblings of William Lincoln Smith/Jim Bluejacket were Hattie June Smith (born 1877), Lola Smith (1882), Louis E. Smith (1896), and David C. Smith (1901). 3 See Sporting Life, August 8, 1914. Sources have long been in conflict regarding whether our subject was of partial Cherokee or Shawnee blood, but circumstances suggest that his mother was Shawnee, among the so-called Loyal Shawnee expelled from Kansas and accepted into the Cherokee Nation in 1869. 4 According to the Daily Illinois State Journal (Springfield), April 2, 1947. 5 New Orleans Times-Picayune, May 29, 1913. See also the Jim Bluejacket obituary in The Sporting News, April 9, 1947. 6 See the Bullpen section of the Baseball-Reference entry for Jim Bluejacket. 7 A contradictory report appeared in the Denver Post, April 1, 1921, which maintained that Bluejacket had played for a Midwest League team in Greybull, Wyoming, in 1920 under the name Smith. 8 As per the Watertown (New York) Daily Times, August 12, 1914, and the Charleston (South Carolina) News & Courier, August 23, 1914. 9 Sporting Life, April 1 and May 27, 1905. 10 In 1905 pitcher Pearl Bluejacket went 4-12 for Vinita of the Missouri Valley League. In its July 31, 1909, edition, Sporting Life reported the signing of an outfielder named Bluejacket by Junction City (Kansas) of the Class D Central Kansas League, but this player could not be our subject Jim Bluejacket. Jim indisputably spent the 1909 season pitching for the Keokuk (Iowa) Indians of another Class D circuit, the Central Association. 11 The New Orleans Times-Picayune, May 29, 1913, states that Bluejacket had briefly been in the US Navy. But on the player questionnaire that she returned to the Hall of Fame library after her husband’s death, Jennie Bluejacket indicated that Jim had been in the Army. The World War I draft card filled out by William Lincoln Smith (aka Jim Bluejacket), moreover, states that he was a recruit discharged on disability from Jefferson Barracks, an Army installation near St. Louis. 12 See the New Orleans Times-Picayune, May 29, 1913, and The Sporting News, April 9, 1947. 13 Daily Illinois State Journal, April 2, 1947. 14 As reported in Sporting Life, November 30 and December 7, 1912. 15 Baseball-Reference provides only the Bluejacket minor-league batting stats for 1914, but years later a local newspaper put his record at 20-4 for Bloomington that season. See the Bloomington (Illinois) Pantagraph, March 26, 1947. 16 As reported in the New Orleans Times-Picayune, July 25, 1914, Washington Post, July 28, 1914, and elsewhere. The terms of the two-year pact covered the 1915 and 1916 seasons at $1,800 per year. See Sporting Life, August 15, 1914. 17 Washington Post, August 4, 1914, and Sporting Life, August 15, 1914. 18 Pawtucket (Rhode Island) Times, August 7, 1914. 19 See e.g., “Jim Bluejacket Repents Too Late,” New York Times, November 7, 1914. See also Sporting Life, November 14, 1914. 20 Sporting Life, November 21, 1914. 21 Robert Peyton Wiggins, The Federal League of Base Ball Clubs: The History of an Outlaw Major League, 1914-1915 (Jefferson, North Carolina: McFarland, 2009), 234. 22 As reported in Sporting Life, May 15 and June 12, 1915. 23 Sporting Life, June 26, 1915. 24 As reported in Sporting Life, November 6 and 27, 1915, and the Jackson (Michigan) Citizen Patriot, April 15, 1916. 25 As reported in the Springfield (Massachusetts) Republican and Washington (DC) Evening Star, February 1, 1916. 26 Hempstead had made his position clear and unyielding on the subject earlier. See New York Times, November 7, 1914. The declination of the Giants to offer Bluejacket a contract for the 1916 season was reported in the Jackson Citizen Patriot, April 15, 1916, and elsewhere. 27 See the Daily Illinois State Journal, March 23, 1916, and Washington Evening Star, April 3, 1916. 28 Per the 1917 Reach Official American League Guide, 175. Baseball-Reference has only 1916 batting stats from Bloomington for Bluejacket. 30 Sporting Life, July 29, 1916. 31 Washington Evening Star, August 8, 1916. 32 See the Fort Worth Star-Telegram, August 14, 1916. 33 Sporting Life, March 5, 1917. 34 As reported in the Muskegon (Michigan) Chronicle, May 18, 1917. 35 Rockford Morning Star, May 18, 1917. 36 As reported in the Duluth (Minnesota) News-Tribune, June 16, 1918. 37 For the Enid engagement, see the Tulsa World, January 11, 1921, and the Daily Register Gazette (Rockford, Illinois), January 28, 1921; for Greybull, see the Denver Post, April 24 and August 9, 1921. 38 As reported in the Anaconda (Montana) Standard, September 8 and 10, 1922. 39 According to the Greybull Standard and Tribune, April 3, 1947. 40 As per an undated 1968 article in the Pekin Daily Times attached to the Carole Hill Martin biographical profile of Jim Bluejacket. 41 As reflected in a circa 1944 article published in the Casper (Wyoming) Tribune Herald attached to the Martin profile. 42 As per the death certificate contained in the Jim Bluejacket file at the Giamatti Research Center.